We are based in Angus, in the countryside north east of Dundee near a village called Kingennie. 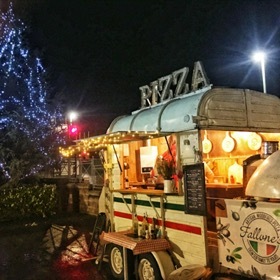 We have a loyal local following here in this area and try to support as many local business as possible both as suppliers and also by teaming up with them for pop-up pizza events. We find that most of our event catering is within Tayside & Fife, but we have catered as far north as Inverness, down to Edinburgh and over to Glasgow and Loch Lomond. We don't charge extra for our mileage and travel time for bookings within 30 miles or 45 minutes travel time. Do you need power and how much space do you need? 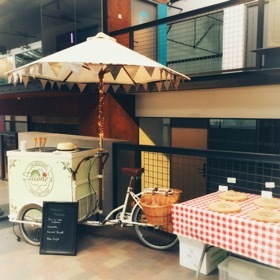 We built our pizza van to be fully autonomous and we carry 50l of water on board for our cleaning/handwashing and electricity for our lights & fridge is provided from a leisure battery. The horse box requires 6m of space when set up from towball to the back of the oven. Please also remember however that we need to be able to tow the horse box into position with our vehicle (either a large 4x4 or a van) and therefore require space to manoeuvre. A nice level area is ideal if possible and not on the public highway (as this introduces complications for local licensing and approval). Usually the venue car park or similar is ideal. Do you cater for different dietary needs? Yes. Our catering menu has a selection of both meat-based and vegetarian toppings, and we also have a few carefully crafted vegan toppings which are very popular. We can also customise any of our toppings to suit individual tastes and swap ingredients as required (e.g. dairy free cheese). Just ask, we're always happy to work with you to get the perfect toppings. 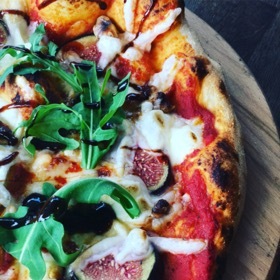 We are regularly asked if we can make gluten free pizzas; We can do this for catering bookings if requested in advance and we know the number required. Due to cross-contamination risks (very important to coeliac customers), we make the GF pizzas at the beginning of service with clean utensils before we open any of the gluten products like flour. How many people can you serve? We have no real limit to how many customers we can serve. We can produce 500-600 slices an hour and we like a challenge! 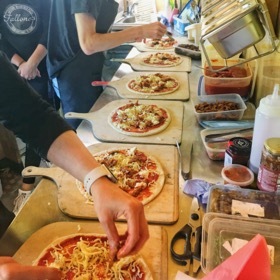 Although we are a small family business, we have worked hard at refining our processes and training our staff so that we can provide the best quality, fastest wood-fired pizza service. We use a team of 2-3 pizzaiolos on dough stretching / toppings, 1 person managing the oven and 1-2 staff serving/plating and managing the buffet table. Our wood-fired oven operates at 450 degrees and cooks pizzas in about 90 seconds. The oven is large enough to handle 6 pizzas at a time and it takes a couple of minutes to stretch the dough and 'dress' the pizza with toppings. 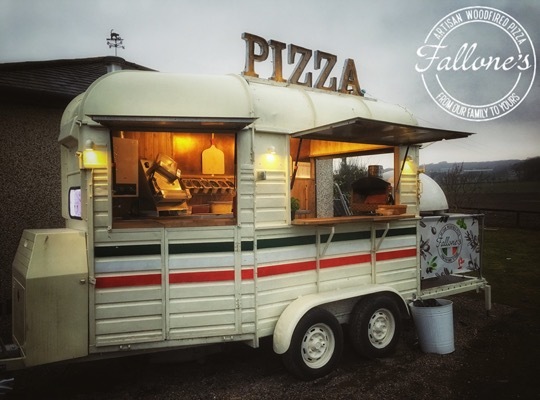 An individual pizza takes about 4 minutes from dough ball to plate, however when we are catering for events we always achieve 70 pizzas an hour. Thats over 500 slices and hour! Yes we have full Public Liability Insurance and our staff are all trained in food handling and hygiene. Do you do kids pizzas? Having kids ourselves we understand that they don't like 'green bits' on their pizzas even if it is just a delicious basil leaf! We can always make simple cheese and tomato pizzas (we call ours 'The Bambino') for the less adventurous. Can we request pizza toppings not from your menu? Of course, we're always happy to work with you to create toppings just for your event - we have lots of fantastic ingredients and plenty of ideas over and above those listed on out catering menu. Yes. We aim to provide you with a turnkey solution for your event. Our quotes are all inclusive of buffet/serving tables, tablecloths, napkins, paper plates, condiments and even a buffet gazebo if you need it. We need to be at your venue 2 hours before service which gives us sufficient time to get set up , but more importantly time to fire up the oven. Once we start service we will stay until all the pizzas booked have been cooked and served and then we will clear down and remove all waste for you. We hate queues - they're not fun for us and they're not fun for your guests. This is why we have chosen a system of catering for events that addresses this. We agree with you the number of pizzas required and a selection of toppings (usually about 4 or 5) and we batch cook from this list. 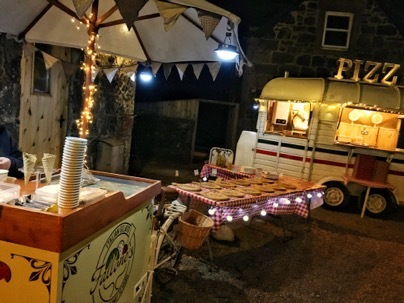 We set up serving/buffet tables either inside your venue or outside beside the van and we start off with 12-15 pizzas on the buffet table at the beginning of service. We then cook pizzas at the rate of 70/hour and we have a member of our staff who slices, plates and replenishes the buffet table until all the pizzas are cooked. 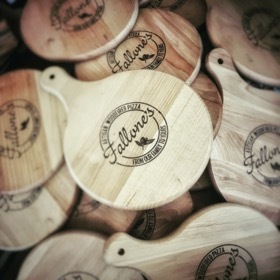 All the pizzas are served on our branded wooden pizza peels and are labelled to allow identification. We find that this works best as everyone can get pizza right away, even at large events. We will still be happy to take 'special requests' at the van for anyone who would like something to suit a dietary requirement. And we love when people come up to the van for a chat. Do you charge differently for different toppings? Do you provide anything other than pizza? Yes - we have expanded our offerings to provide everything you might want from and Italian caterer for your event/wedding. We have a large selection of canapés (crostini), antipasti sharing boards (artisan meats, rustic breads, oils, balsamic vinegars and olives) and we can have our own staff serve these directly to your guests if required or add these to the buffet table. We can also provide Mediterranean leaf salads and both meat and vegetarian pasta salads to accompany pizzas for your buffet. 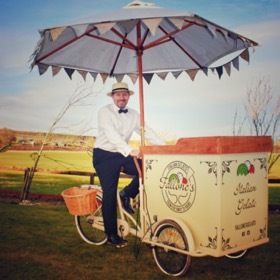 We even have your desserts covered… Continuing our Italian family tradition, we have imported all the equipment from Italy and now make our own Gelato which we can serve either in tubs or in waffle cones from our vintage ice-cream tricycle. This makes an amazing centrepiece for any event and we have an ever growing number of amazing artisan flavours for you to select from. Where can I sample your pizzas? We love our public pop-ups. 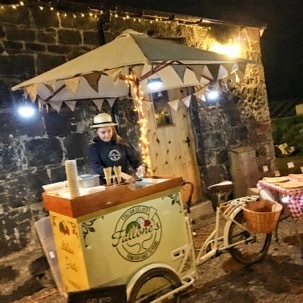 We have a regular pop-up at the beach in Monifieth every Friday evening from spring to autumn. It is hugely popular with the locals and as well as our pop-up menu, we always have some special toppings on from our catering menu. 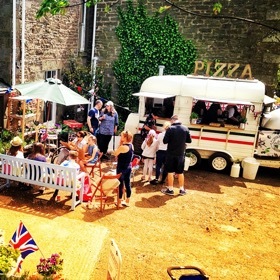 Come along and try some pizzas directly from the van! Other pop-ups are as we can fit them in between private bookings and will be updated on our Facebook page. Due to the logistics and work involved in preparing for any event (dough, toppings etc.) 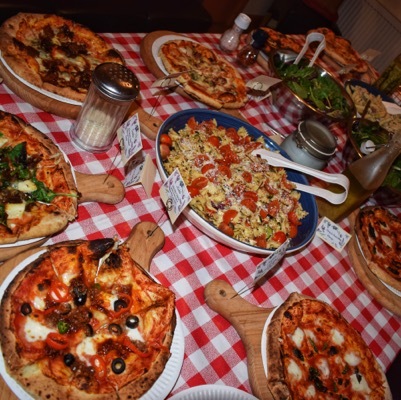 we have a minimum booking size of 50 pizzas (no maximum!) which caters for up to 80 guests. 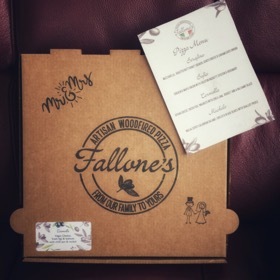 If there are any pizzas remaining at the end of service, we will gladly box them up in our hand-printed and labelled boxes for you. We often find these are very popular late in the evening or even the next morning! How much does it cost per head for a private booking? As we have many options available (starters, canapés, pizzas & desserts), the quotes vary considerably. We also offer a discounted price for September - May and further discounts for midweek bookings. For budgetary purposes please allow between £7.50/head up to £18.50/head. Please contact us for a chat and we will be happy to help you with a quotation. Can you suggest wedding venues that are suitable for this style of catering? Once we have had a chat and agreed the basics (date, time, numbers, location etc.) we will send you an invoice which captures all the details. We request a 30% deposit to secure the booking and the balance to be paid in full 7 days before the event. Our bank details are provided on the invoice.